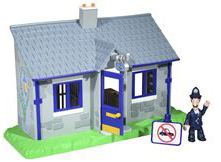 The Police Station Playset includes an articulated figure of PC Selby and a road traffic sign accessory. The playset is reversible; the inside has a front desk behind which PC Selby can stand. The Police Station even has an opening door leading to a little lookalike jail, though since as we know nothing truly sinister ever happens in Greendale its actually PC Selby’s Lost Property Dept.